Traditional Upland Bush Pants. Photo courtesy of She Safari. 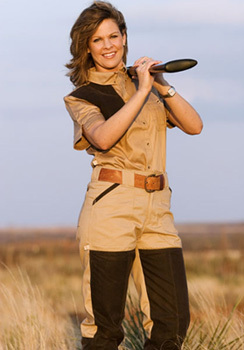 I have noticed that for today's female hunter and outdoor enthusiast She Safari offers style and comfort as well as versatility in their outdoor adventure clothing. These Traditional Upland Bush Pants exemplify those qualities. These pants are designed in the traditional bush pant style, but are tailored for comfort and the female figure. The Traditional Upland Bush Pants are made from soft, durable, 8-ounce chino twill. An 8.5 ounce, chocolate colored, waxed cotton facing lined with 5-ounce soft hand cotton for all day comfort covers the front of the legs from about mid thigh and continues down to the hem. The waxed cotton has also been added to the back of the pant legs just below the knees so that both the front and back of the pants are protected from the knees to the hem. I have found that having the heavy waxed cotton facing on the legs helps protect you from stickers and low lying brush as you make your way through thickets. It lets you slip through brush without catching like broader woven materials. Since it can be a little damp in the Oregon woods, I especially appreciate the water repellent feature of the waxed cotton. For functionality and style, the pants offer roomy front and rear pockets that are trimmed in chocolate waxed cotton. There are seven sturdy belt loops at the waist and if you're like me and sometimes find that pants fit nicely everywhere except at the back of the waist, She Safari uses YKK zippers and has added a button and elastic adjustment that helps to minimize the gap and make a more comfortable fit. The Traditional Upland Bush Pants do not come hemmed, but if you do not mind waiting a couple of extra days for delivery, She Safari will hem them for you. Like my She Safari Upland Short and Long Sleeve Shirts, maintaining these pants is easy. Just wash in cold water, hang to dry or put in the dryer on low heat. I wish that all of my washables were that simple to take care of. No matter where your next hunting trip takes you, the She Safari Traditional Upland Bush Pants would be a great addition to your outdoor adventure wardrobe. Copyright 2007, 2013 by Maria Williams. All rights reserved.